Whitby Town grabbed their first win of the summer after an improved display against highly-rated Northern League outfit Marske United, on Tuesday night. Marske, who won the top tier in 2015, boasted two former Whitby players in Jamie Owens and Nathan Mulligan, while Blues boss Chris Hardy made three changes from the side that lost 2-0 at Guisborough on Saturday. Mark Robinson replaced Jamie Poole at centre-half, towering marksman Anthony Hume gained a first start in pre-season and Jordan Jewson, returning after his release from Hartlepool United, joined him up front. Town started well with Dave McTiernan wearing the captain’s armband and testing Robert Dean with a curled diagonal effort from the left edge of the box that the keeper held comfortably. Whitby enjoyed a good spell just after the midway point of the first half when Jewson smashed a 25-yarder narrowly high and wide. However, it was the visitors who should have led on 28 minutes when Glen Butterworth’s left-wing corner picked out an unmarked Andy Ramsbottom who saw a near-post header blocked on the line and the resulting clearance flying wide off Owens. To their credit, the Blues responded well as Dan McWilliams sent over a left-wing corner, at the other end, within a minute, finding Hume, who nodded just over. Seconds later though, came the Blues’ opener. Great interplay down the right released overlapping right-back Callum Martin, who found McTiernan free at the far post to place a close range header past a helpless Dean. Marske pressure culminated in Owens chipping across the six-yard box and wide, while there was a blow for the Blues, three minutes before half-time, as McTiernan limped off with a hamstring injury. Dale Hopson replacedhim and Robinson reclaimed the skipper’s armband, before Jewson forced Dean to tip wide acrobatically with a ferocious, goalbound edge-of-the-box effort. Last season’s top goalscorer Mikey Roberts came on for Hume at the break and opened his account within six minutes of the re-start. The diminutive ex-Spennymoor striker robbed his marker and tricked his way along the right byline, forcing Dean to parry at his near post before sliding the six-yard rebound past the stopper and a defender on the goal-line. Marske almost hit back, just before the hour, after a lovely move, only for Danny Earl to be denied by a combination of an offside flag and the outside of Bland’s right-hand post. Soon after, Bland made way for James Dawson, but the action remained at the Marske end as Weledji headed down McWilliams’ inswinging corner, from the right and Jewson backheeled just wide of the far post. Hopson came close with a rising effort and Weledji poked just wide of Dean’s near post after the away side failed to clear a short, left-wing corner. Meanwhile, Marske had introduced a group of talented young attacking players including Dan Newby and Nathan Plews. With six minutes left, Newby robbed Hopson but could only muster a scuffed shot straight at Dawson. Later, Plews brought a terrific block with his left leg from Dawson, after unleashing a drilled 18-yarder. In-between, Hopson played in Roberts who slammed an edge-of-the-box effort of his own, inches wide. Town particularly impressed in midfield where Cameron Park and Steven Snaith, in particular, looked accomplished and pulled most of the strings. On Saturday, Town were beaten 2-0 on the road at Guisborough Town in their annual Mickey Skinner Trophy clash. 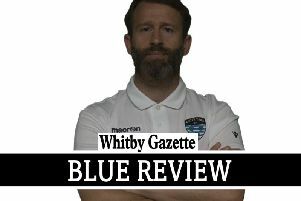 The Blues began strongly and made most of the early running but fell behind before half-time when former Whitby man Thibault Charmey struck. Mikey Roberts saw a second-half penalty saved after Ste Snaith was brought down in the box, then a late second goal from substitute Jordan Lee sealed the Priorymen’s victory.